DANCE OF SHIVA is a cultural musical event and gathering based on theme of India and India-inspired music that has been making a legend for over 9 years in Japan. To celebrate the 10th anniversary, in 2016 we will be hold a party in the place of legend where Shiva lives in the Himalayan outback of Manali. 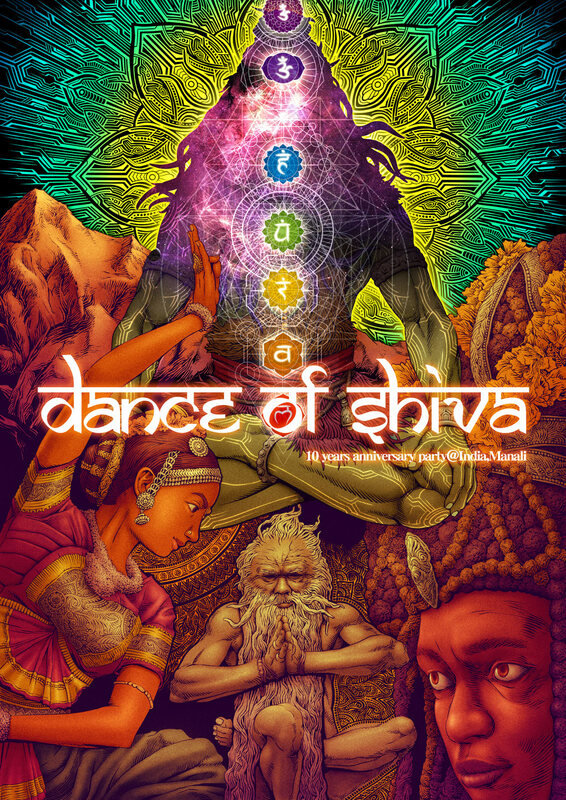 DANCE OF SHIVA continues the tradition from India since ancient times to the latest fusion of psychedelic dance music. Although the two elements seem contradictory, for the purpose of raising conscious awareness, in the sense it is one and the same. As in the raga tradition in Indian classical music, there is a time for playing each type of music. Indian classical quiet time in the morning. And then,the appropriate folk dance festival will follow. As time goes by the flow gradually heats up into psychedelic dance music with FULL POWER!! FULL DANCING!! 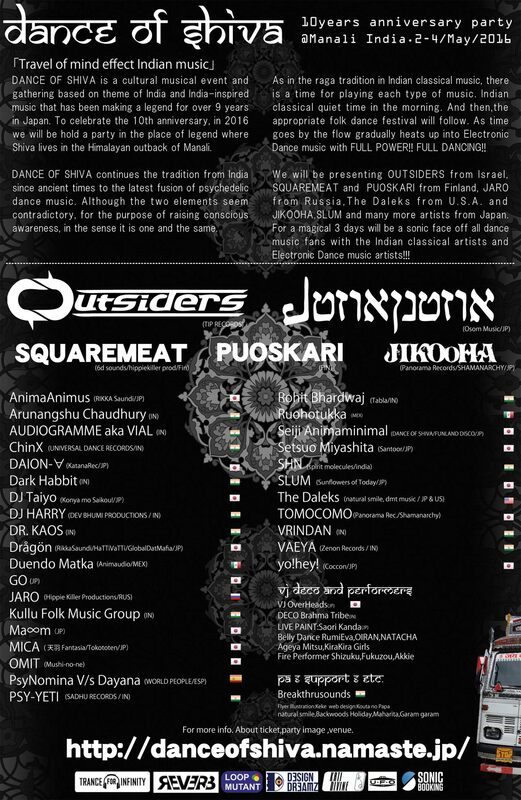 We will be presenting OUTSIDERS from Israel,SQUAREMEAT and PUOSKARI from Finland, JARO from Russia,The Daleks from U.S.A. and the stalwart of SUOMI SOUNDI from Japan SeijiAnimaminimal. For a magical 3 days will be a sonic face off all dance music fans with the Indian classical artists and electronic dance music artists!!! Manali is located inside of holy himalayas where SHIVA lives. From '70s so many foreign people come to enjoy for party in this place. Manali is very fascinating that many foreigners who moved into Manali and living here. India is wide and big. India has so many faces. But we believe Manali is one of the most beautiful place in India. We are very happy to take place music party in this place and share peace and happiness with many friend. Party date is 2nd-4th/May/2016 at Manali. At morning, Music will start from calm Indian classical. As time passing by, Music chenging into electronic dance music. Same as 'RAGA', Music has specific time to play. At night, Music become danceable and strong. We want to make best party. We want to make great monent for all dancers. Try to provide best sound. Want to meke best party. From India classical to cutting edge electronic dance sound. Try to mix both good point and make great mood. You can enjoy different kind of electronic dance music from all over the world!! We are working with same PA crew as Mumch Fes. What gathered 1000 people at 2015/Autumn party. We had selected best location around Manali. You can buy party ticket online. 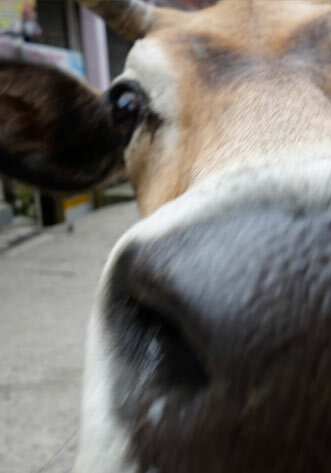 And in Kasol and Manali. Ticket price is 4200JPY(2500Rs). 400 ticket limited. ��here I can buy party ticket? You can buy party ticket in Kasol shop and Manali Shop. Party ticket is 400 ticket limited. ��hich equipment do I need? This is camp-in party. Please bring your TENT and Sleeping bag. Please pitch a tent by yourself. We don't take tent site fee. While party,you can't go and back to your HOTEL for sleeping. Only you can come or go back once. We sell food ,beer snacks and chai at venue. You don't need to worry about food and drinks. Please DO NOT bring any illegal substance. ��hat we want to do in this party. We want to make great monent for all dancers. We want to provide best sound. Want to meke best party. Try to mix Indian classical and cutting edge electronic dance sound. We don't refund ticket fee after you purchase in any reason. © 2015-2016 DANCE OF SHIVA All Rights Reserved.